How to work with elevation data in Locus? base of calculation of route elevation gain when planning. Please do not confuse with current altitude that is obtained from GPS data together with values from the barometric pressure meter in your device (if applicable), see more >>. 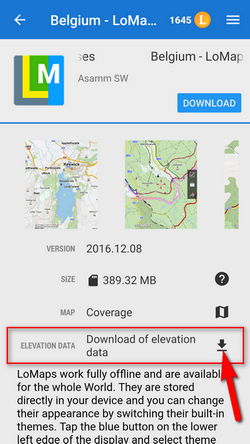 Current altitude values are also used for calculating elevation gain in recorded tracks and are available also for Locus Map Free users. Viewfinderpanoramas.org - SRTM3 data enhanced in mountainous and polar areas. Resolution 3“. Open Data Portal - very accurate data obtained from LIDAR mapping missions - covering Austria, Luxembourg, Spain, Slovenia, Northern Italy and part of Germany. Resolution 3”. colored elevation - elevation levels are differed by colors (e.g. lowlands are green, mountains brown).